U.S. Navy Brings Back Navigation By The Stars For Officers A decade after phasing out celestial navigation from its academy courses, the U.S. Navy has restarted that formal training. The shift comes at a time of growing anxiety over possible threats to GPS. Navigation aboard the guided-missile destroyer USS Stout is done by computer, as is the case on many other ships. The U.S. Navy now wants more of its officers proficient in celestial navigation. This is the challenge facing the U.S. Navy as it tries to bring back celestial navigation. 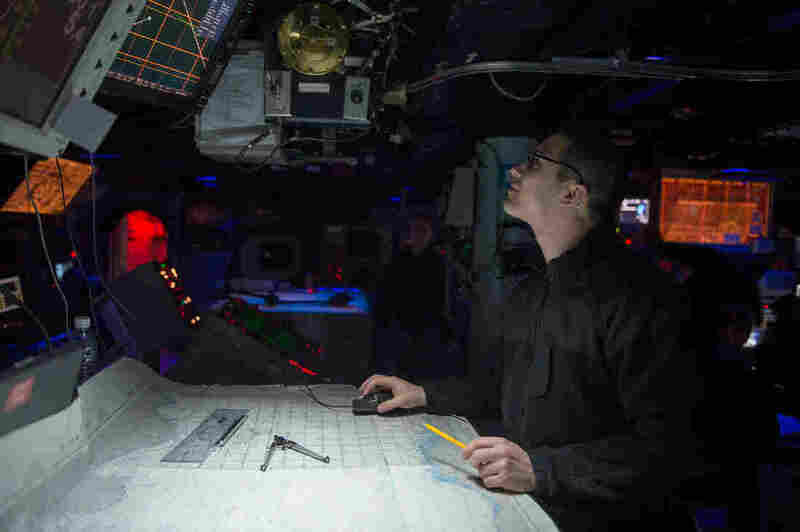 The Navy stopped training its service members to navigate by the stars about a decade ago, focusing instead on electronic navigational systems. But fears about the security of the Global Positioning System and a desire to return to the basics of naval training are pushing the fleet back toward this ancient method of finding a course across open water. Navigation by the stars dates back millennia. The ancient Polynesians used stars and constellations to help guide their outrigger canoes across thousands of miles of the Pacific Ocean. And right up until the mid-20th century, navigation on the sea was usually done by looking at the heavens. That changed in the late 1970s, when the military began launching GPS satellites. The satellite system provided a far more accurate fix than the stars could. In 2000, the U.S. Navy began phasing out sextants and charts in favor of computers. Rear Adm. Michael White, who heads the Navy's training, says the change in curriculum was driven by the need to bring young officers up to speed on the Navy's equivalent of Googlemaps, called the Voyage Management System. It uses GPS, radar and other tools to precisely track a ship's position and course across the ocean. The system is complex and, "we don't have infinite training time available," White says. 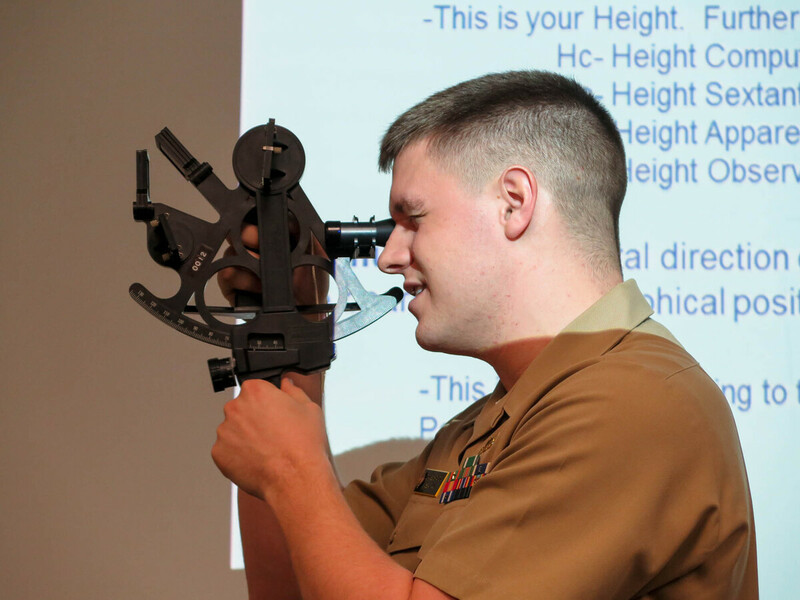 Lt. Daniel Stayton demonstrates how to use a sextant before a class of midshipmen at the U.S. Naval Academy. So, why return now to the old ways? The Navy and other branches of the U.S. military are becoming increasingly concerned, in part, that they may be overly reliant on GPS. "We use it to synchronize all military operations, we use it to navigate everywhere — it's just something the U.S. military can't live without," says Brian Weeden, a former Air Force officer now with the Secure World Foundation, a nonprofit that studies security issues in outer space. In a big war, the GPS satellites could be shot down. Or, more likely, their signal could be jammed or hacked. Already, jamming has become more common, Weeden says. "You can buy a lot of GPS jammers off the Internet," he says. "A lot of those are made by Russia." He thinks the Russians probably have systems to jam the special signals the military uses as well. And China may be developing similar capabilities. White, who heads the Navy's training, says there is also a desire to get back to basics. Over the past decade, electronic navigation systems on ships have become easier to use, so less training is required. He says the Navy is bringing back celestial navigation to make sure its officers understand the fundamentals. "You know, I would equate it to blindly following the navigation system in your car: If you don't have an understanding of north/south/east/west, or perhaps where you're going, it takes you to places you didn't intend to go," he says. In fact, there has been at least one incident in the past decade when a Navy ship ran aground partly because of problems with the electronic navigation system, investigators say. Back in the classroom at the Naval Academy, the midshipmen finishing up their first course seem a little bewildered. Until now, says 20-year-old Audrey Channell, celestial navigation wasn't on her radar. "I mean, obviously I heard about using stars to navigate in the old days," she says, "but I never thought I'd be using it." Like many of the others in the class, she uses GPS to navigate her daily life. Her instructor, Daniel Stayton, says that's OK. Nobody expects these young officers to become Magellans overnight.